Well, we got sucked in by a commercial again. 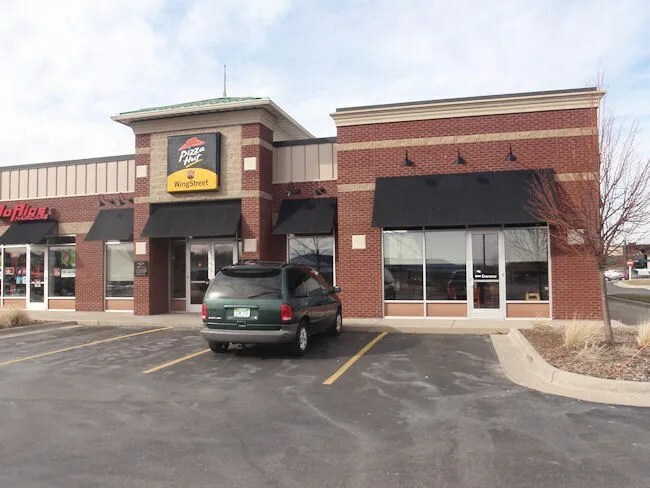 It’s not entirely a bad thing it’s just that we haven’t had much luck the last few times we’ve been to a Pizza Hut. We had a pretty miserable experience at one in Lansing and and not quite spectacular one at the Westnedge carry-out location. Still, the $10 Dinner Box seemed like too good of a deal to pass. Even though it was a beautiful day, J and I spent it like we do most Sunday’s. On the couch watching NASCAR. We had already went out for breakfast so we didn’t want to press our luck by going out for two meals with a seven week old baby. Sometime during the race, we saw a Pizza Hut commercial for the $10 Dinner Box and J said that sounded really good. Around 4:30, I jumped online and placed my order via pizzahut.com. Right on the front page, they had a ad for the meal so I didn’t even have to search the website for it. 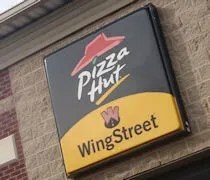 The closest Pizza Hut to us now is the one on West Main near the intersection with 9th Street right in front of the Menards. It’s in the same small shopping center as D’Nicio’s Parlour. My email confirmation said the order would take less than fifteen minutes. I walked in to the store at almost exactly that time my order was supposed to be ready. I didn’t notice it on my drive in, but there’s actually a drive thru pickup window on the east side of the building. There’s really not a good place for pick up inside. I didn’t realize this location is a full sit down restaurant, but I went to the host station and told the guy I was there to pick up an order. He took me back to the closest computer and looked up my order. I had to pay in store because they wouldn’t take payment online for some reason. After running my credit card, he headed to the kitchen to pick up my pizza. He told me I had great timing as the pizza was being boxed up as he went to get it. The $10 Dinner Box consists of a medium pan crust pizza with one topping, five breadsticks with marinara, and ten cinnamon sticks. 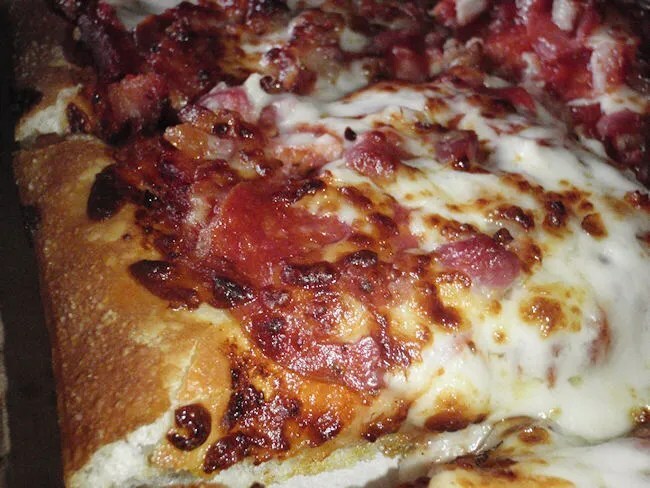 We got pepperoni and bacon on our pizza. The extra topping cost another buck. We both started with bread sticks. 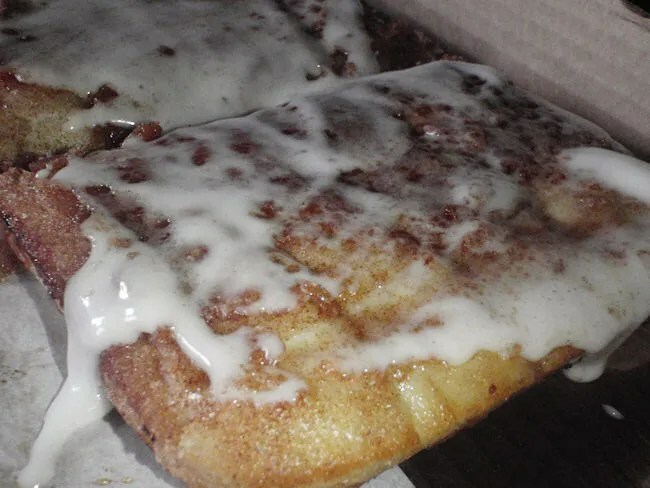 By far, my favorite thing about Pizza Hut is their bread sticks. I would make an entire meal out of them if I could. They’re topped with Parmesan cheese and an Italian seasoning mix. Since we can’t split five evenly, I took three of them and gave J two. J asked for another after she finished her two, but quite frankly, she’s lucky she got that many. That’s all I really wanted from the box. 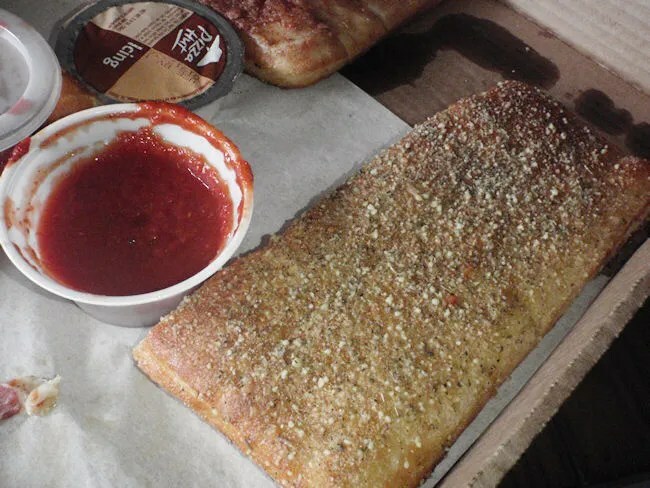 I have always loved Pizza Hut’s bread sticks. After destroying the sticks, we both grabbed a couple slices of pizza. To fit in the box, they make this one in a square, but it’s not a Detroit Style square. It’s just a regular Pizza Hut pan pizza in a square shape. The crust is really soft and chewy with almost no crunch. J took a bite and asked if I ordered ham instead of bacon because the bacon was not crispy at all either. Taste wise, it was alright. I don’t think either of us had a major complaint about it, but it’s not the best pizza we’ve ever had either. After a couple slices of pizza, I opened up the icing. Instead of dipping, I spread it on top of the sticks. J thought they were pretty good, but there was something about them that seemed a little off to me. The icing and cinnamon made them sweet enough that whatever I didn’t really like about bread seemed not important. The biggest thing I can say about our Pizza Hut dinner tonight is that it was a great value. We got a lot of food for just over $11 and I ate on the pizza for a couple days. I’d order this meal again. It wasn’t the best pizza I’ve ever had, but it’s really hard to complain about the price.